L 21″ (53 cm) W 54″ (137 cm). Description: Sexes similar. Breeding adult is slate gray above and white below with a white head; pale eyes; yellow bill with dark red spot; and yellow legs. Winter adult is similar to breeding but with brown streaking on head and neck. Third winter bird shows black on bill, yellow or rarely pink legs, and some brown in the wings. 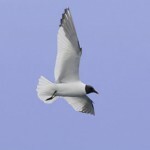 Second winter bird has dark gray back, brown wings, pale bill with a black tip, and pale legs that are sometimes yellow. First winter bird is streaked with brown overall, has pale legs, and an entirely black bill. 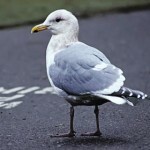 Habitat: Frequents garbage dumps, sewer outlets, coastal beaches, tidal flats, reservoirs, and sometimes plowed fields with other gull species. Where in Nebraska: Very rare. First seen in Nebraska at Pawnee Lake, Lancaster County in 1992. Also seen at Kingsley Dam in 1994. 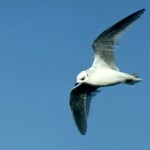 Field Notes: A European species that is increasing in occurence on the Atlantic Coast. 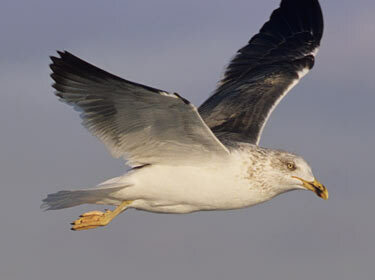 Fun Facts: The Lesser Black-backed Gulls that reach North America breed in Iceland, Britain, and western Europe.